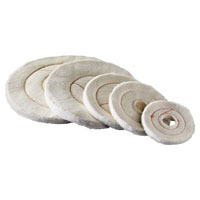 Departments - BUFFING WHEEL BP60-4"
Canton Flannel Buffs - For use with rouge to color gold, silver, and other precious metals. Discs of soft flannel joined by two or four circles of lockstitch sewing. Follow intricate contours easily and will not scratch. Recommended for all final coloring operations. This extra soft wheel will give you the most brilliant finish of all buffs. Made of the finest combed flannel to create an extra soft nap. Blistered and boxed buffs have a 1" hole size packaged with DICO toothed flanges for 1/2" spindle. With bulk orders please specify required arbor hole size.